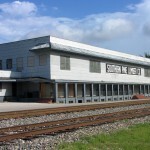 Condition: Good; interior has been altered. 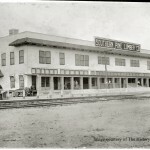 Description: 2-story; wood frame with ptd [painted] particle board or plywood siding; masonry foundation; rectangular plan with smaller extension on south side; flat roof with parapet; small clay tiled roof below parapet on front facade; gallery porch across front with flat roof, square brick columns, wrought iron railing; wood-paneled and plain wood doors; windows with obscure screening. 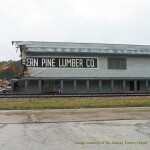 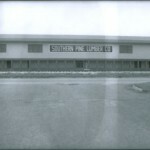 This structure was demolished on December 6-8, 2004 by its owner, Temple-Inland, Inc. 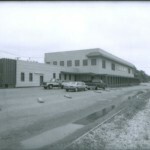 The History Center has provided some historic photographs of the structure as well as those taken during the demolition. 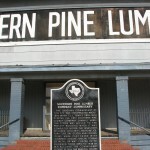 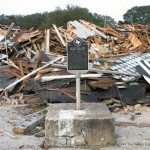 In 1980 the Texas Historical Commission erected the marker visible in several of the photographs.